Running parallel to the Tonle Sap river, Sisowath quay forms Phnom Penh's elegant riverfront. This is a beautiful area with a peaceful and wide riverside walk featuring colonial style lampposts, palm trees and pavilions. 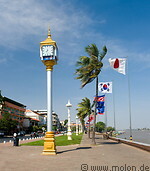 Along Sisowath quay, facing the river, are many of the best and liveliest restaurants, cafes and bars of Phnom Penh. This is where tourists converge to relax in the cafes, enjoy the views, stay in the hotels and plan their trip.